Parker Solar Probe continues to bring its instruments and secondary systems online — slightly ahead of schedule — as it speeds away from Earth. On Friday, Aug. 31, flight controllers at the Johns Hopkins Applied Physics Laboratory in Laurel, Maryland performed a second planned Trajectory Correction Maneuver (TCM-2), a thruster burn which lasted for 35.2 seconds. This maneuver, which was executed with a high degree of precision, adjusted the direction of the spacecraft to position it for its Venus flyby on Oct. 3, when it will use Venus’ gravity to shed speed and draw its orbit closer to the Sun in preparation for its first solar approach. On Sept. 2, four two-meter electric field antennas, part of the FIELDS instrument suite, were deployed. These antennas (as well as a fifth, which is mounted on the long boom at the other end of Parker Solar Probe) need to be extended away from the spacecraft to accurately measure the electric fields of the corona. These four antennas are not protected by Parker Solar Probe’s Thermal Protection System, or heat shield, so they are made of niobium C-103, a high-temperature alloy that can withstand the intense solar heat. Just a few hours after the FIELDS antennas were deployed, the Solar Wind Electrons Alphas and Protons (SWEAP) investigation team successfully opened the covers of two instruments, the Solar Probe Analyzer (SPAN) instruments. The SPAN instruments are used to measure the solar wind when it is coming in at an angle relative to the spacecraft. Before opening the SPAN instrument doors, the team ramped up high voltages on the Solar Probe Cup (SPC) instrument, also part of SWEAP. Solar Probe Cup measures the thermal solar wind plasma flowing radially from the Sun — requiring this instrument to be mounted outside the heat shield and pointed directly at the Sun. Like the FIELDS antennas, Solar Probe Cup’s heat shield is constructed of niobium C-103. Other systems and instruments have completed checkouts as well. The spacecraft’s high gain antenna — which will be used to send high-rate science data to Earth — has been moved through its full range of motion. EPI-Lo and EPI-Hi, the two Energetic Particle Instruments that make up the IS☉IS suite (pronounced “ee-sis” and short for Integrated Science Investigation of the Sun), have been turned on and have completed low voltage checks. The Wide-field Imager for Solar Probe (WISPR) instrument has been turned on and has taken closed-door test images to calibrate the systems and imagers. 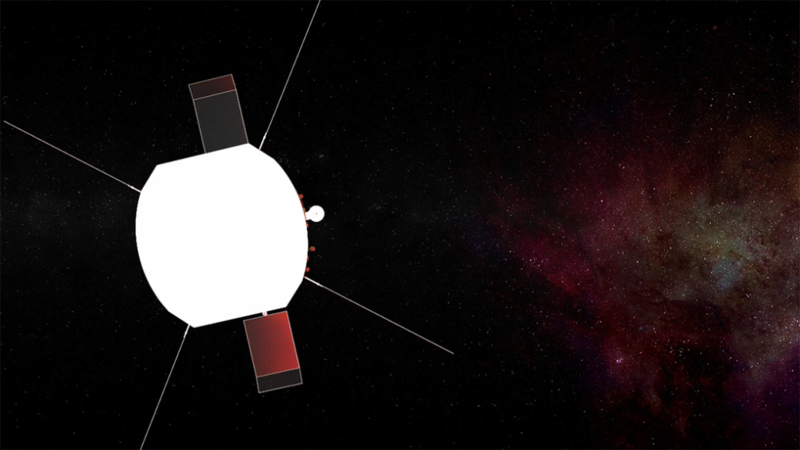 “The spacecraft continues to perform as designed, and thanks to the team’s careful planning and execution, we’re commissioning instruments slightly ahead of schedule,” said APL’s Andy Driesman, Parker Solar Probe project manager. As of 12 p.m. EDT on Sept. 4, Parker Solar Probe was more than 15 million miles from Earth, travelling at about 44,700 miles per hour (72,000 kilometers per hour). Editor’s note: The original version of this post misstated the length of the TCM-2 thruster burn. This version has been updated with the correct figure.